Wesley Homes is known across the Seattle, Washington metro area for its state-of-the-art continuing care retirement communities that have served generations of northwest seniors and their families, and a highly-regarded in-home healthcare program that has 50% more patients than a year ago. “The rapid growth of our home health organization is due in large part of the accessibility of our home care services, the compassion of our clinicians and the successful deployment of our new point-of-care documentation solution,” noted Melinda Moore, executive director of the home health group for Wesley Homes. Moore, whose parents live in a continuing care retirement community, understands the importance of providing patients with a quality care experience. She approached the search and eventual selection of her team’s documentation platform with a new level of patient care in mind. The home care provider documented patient visits on paper until January 2014, when Wesley Homes first made the switch to point-of- care documentation on a laptop. “We really needed a flexible, compliance-driven point-of-care documentation solution to help our team of 20 clinicians and more than 50 private duty caregivers streamline their complex workflows in a way that improved our processes and overall patient care,” Moore explained. The laptop-based documentation solution quickly fell short of the needs and expectations of the Wesley Homes in-home care team, because it wasn’t user friendly enough for the clinicians. “In our search for a better platform capable of meeting our unique care documentation requirements, we landed on the Brightree Home Health point-of-care solution on the iPad,” said Moore, who was the Director of Clinical Services for home health before heading up the in-home healthcare team. Unlike laptops with their sizable screens, often perceived as a wall between patients and their caregivers, the Brightree app on the smaller, familiar iPad encourages engagement throughout the documentation process. The intuitive nature of Brightree Home Health software is opening doors for new growth, new opportunities and new recruits at Wesley Homes, where the Medicare home health patient census has grown from 100 patients to over 150 in just one year. Total monthly patients served between both the Medicare home health agency and the home care program grew from 300 in January 2015 to 450 in September 2015. Even those clinicians who are unfamiliar with the iPad or Brightree have quickly adapted to the user-friendly technology. “When we first introduced the Brightree solution, one of our best caregivers held up the iPad and looked at me with tears in her eyes and said, ‘I’m not tech savvy. I don’t know technology. I can’t do this,’” Moore recalled. “We helped her with logging in and she took the iPad on her visits, and in a matter of a few days she was documenting 100% of her patient visits with Brightree on the iPad. Now that same clinician is training our new caregivers on the Brightree iPad app,” Moore said proudly, noting 99% of her home care staff uses the Brightree Home Health point-of-care solution on the iPad. 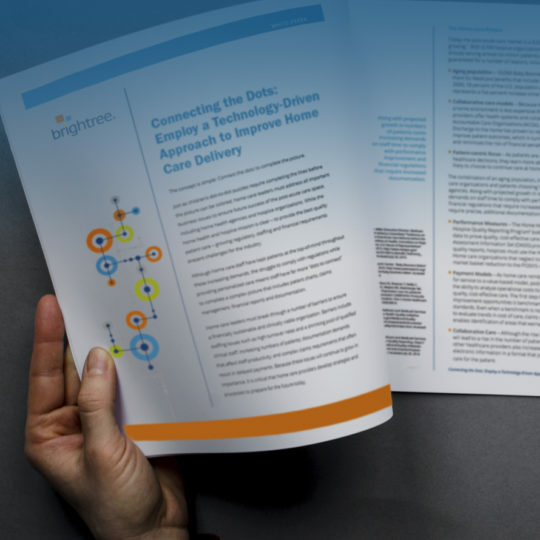 Since deploying Brightree, Wesley Homes reports a 71% drop in overall documentation processing – the time it takes for a clinician to record the start-of-care visit, a Plan of Care, and all the orders, as well as complete coding reviews. Typically, that used to take a week or longer. Now it requires just a day or two. Initial billing, also known as the Request for Anticipated Payment (RAP), was also dramatically cut 56% from an average of 16 days to a week or less, while days to final claim was reduced by three weeks or 50%. Because of the checks and balances and authorizations enforced in the Brightree system, Wesley Homes has virtually eliminated Medicare reimbursement denials. That is critical for a relatively small shop where five full-time employees (FTEs) are wearing multiple hats and relying on the workflow efficiencies they’ve gained from Brightree to comfortably manage the organization’s growing census volume. “Our billing and coding teams can securely access the information they need to process the financials and patient care codes at the backbone of our operation,” Moore said, noting the seamless nature of the Brightree system. Wesley Homes commissioned an external audit of clinical records which was completed eight months into the Brightree deployment. Findings included excellent compliance of visits to orders and documentation to care plan. Reviewers also found that discipline-specific clinical documentation is complete, thorough and ready for ICD-10 requirements. “Brightree is driving impressive order and authorization compliance for us,” Moore highlighted. “Everything from revenue flow to patient care has been improved over the course of our first year with the Brightree solution,” she reported. According to Moore, the solution is compliance-driven, but not so “locked down” that it keeps the team from developing creative care plans and incorporating information unique to the in-home care business line. Clinicians can easily pull up previous patient visit notes to track vital signs and treatment history for a clear picture of how the patient is progressing toward goals along the course of care. As a result, Wesley Homes’ home health team is better informed and able to make better decisions when considering recertification versus discharge. “We have a patient’s progress report and thorough visit notes at our fingertips with Brightree, so our decision points are far more objective and accurate than a gut feeling about signing off on a discharge,” said Moore. Wesley Homes is on the verge of offering hospice care to communities throughout the Seattle market, and Brightree will be the point-of-care documentation solution based on recent success. As a long distance caregiver for her parents receiving the spectrum of in-home services, from home care, home health, and hospice, Moore appreciates the importance of having a fully integrated EMR to ensure safety, quality of care, and satisfaction by both the patients and care providers.